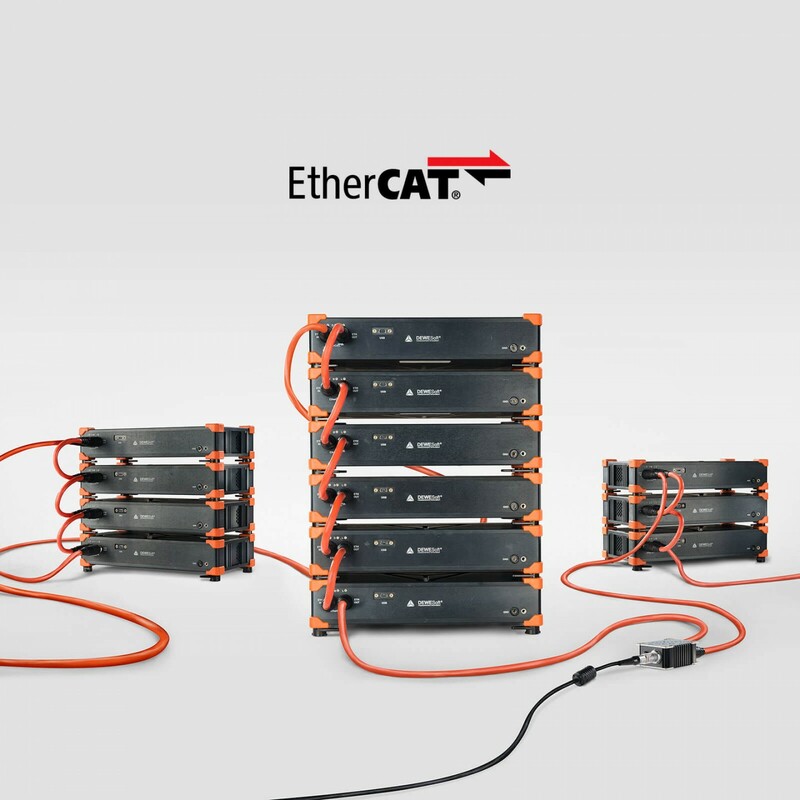 World's most versatile USB and EtherCAT data acquisition system. 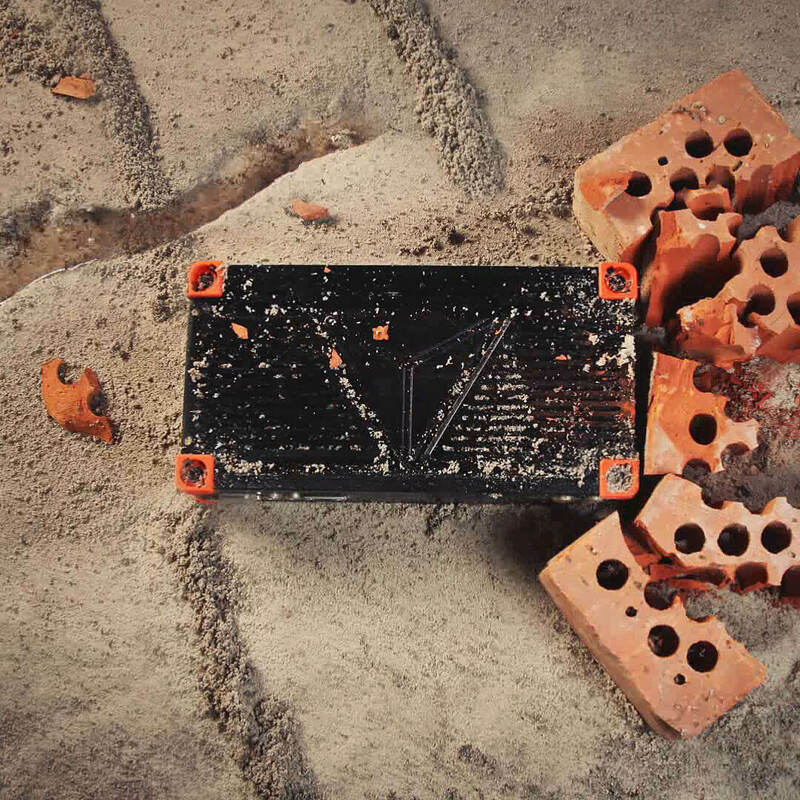 Any signal, any sensor, packed with cutting edge technology. USB/ETHERCAT INTERFACE: SIRIUS DAQ system can be connected via USB or EtherCAT to any Windows compatible PC or to one of our high-performance SBOX data loggers. ANY SENSOR: Array of different amplifiers are available that can acquire data from virtually any sensor on the market. IEPE, voltage, high voltage, charge, full/half/quarter bridge, LVDT, RTD, thermocouples, current, resistance, counter, encoder, and digital inputs are available. UNIVERSAL ANALOG INPUTS: Universal analog amplifiers can accept voltage and full/half/quarter bridge signals natively as well as IEPE, charge, thermocouples, RTD, current, resistance, and LVDT signals with the use of DSI adapters. 160 dB DYNAMIC RANGE: Our DualCoreADC® technology boosts dual 24-bit delta-sigma ADC's with an anti-aliasing filter on each analog channel, achieving astonishing 160 dB dynamic range in time and frequency domain with 200 kHz sampling rate per channel. 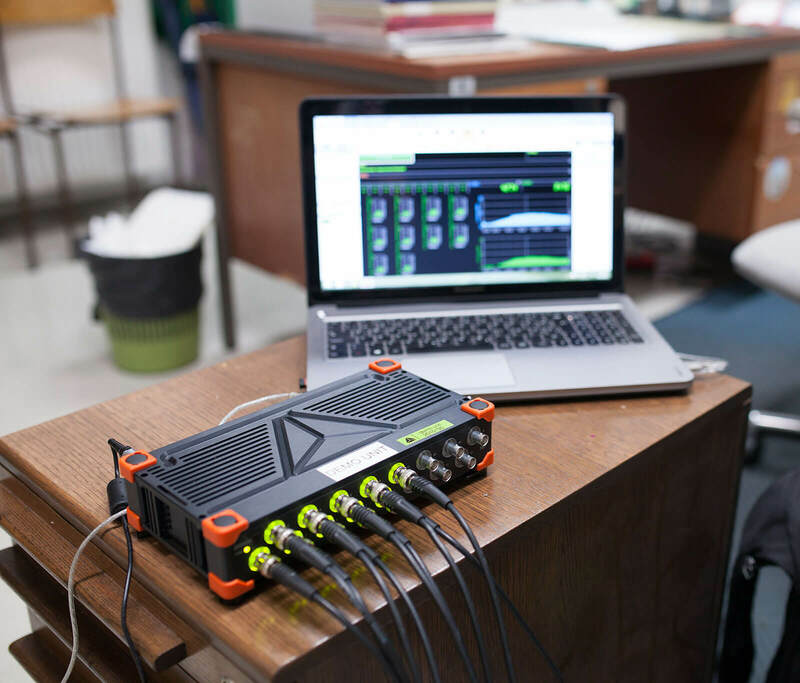 1 MHz SAMPLING RATE: Combination of software and hardware allows for acquisition speeds up to 1 MHz per channel on SIRIUS HS devices with real-time data processing and streaming to disk. FLEXIBLE AND SCALABLE: SIRIUS DAQ system can grow with your needs. You can start with a single channel and scale the system to thousands of channels at any time. SENSOR POWER SUPPLY: Amplifiers provide channel-independent, programmable power supply for sensor excitation. 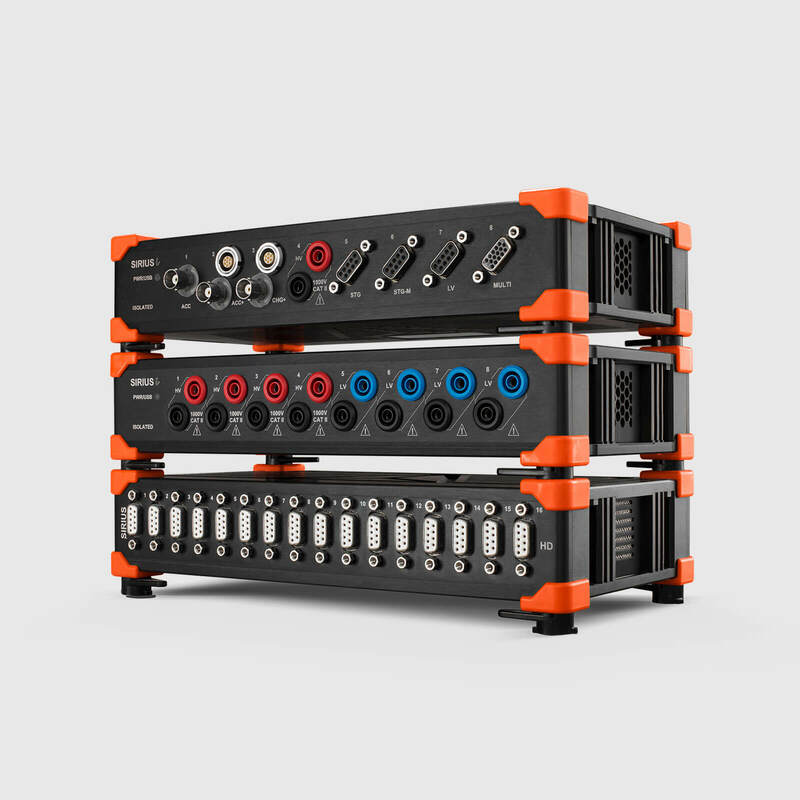 DIGITAL/COUNTER/ENCODER INPUTS: Each channel is capable of 3x digital inputs, 1x event counter, encoder, period, pulse-width, duty-cycle, and precise frequency and angle measurement using patented SUPERCOUNTER® technology. ANALOG OUTPUTS: SIRIUS slice can be configured with 8 analog outputs and can function as a multi-channel function generator, analog replay, or control device with the output voltage signal of ±10V. FULLY SYNCHRONIZED: Each channel, analog, digital, or CAN is synchronized with microsecond accuracy. SOFTWARE INCLUDED WITH FREE LIFETIME UPGRADES: The easy-to-use but rich in functionality, award winning DEWESoft X3 software is included. All upgrades to the software are free forever with no hidden lisensing costs. 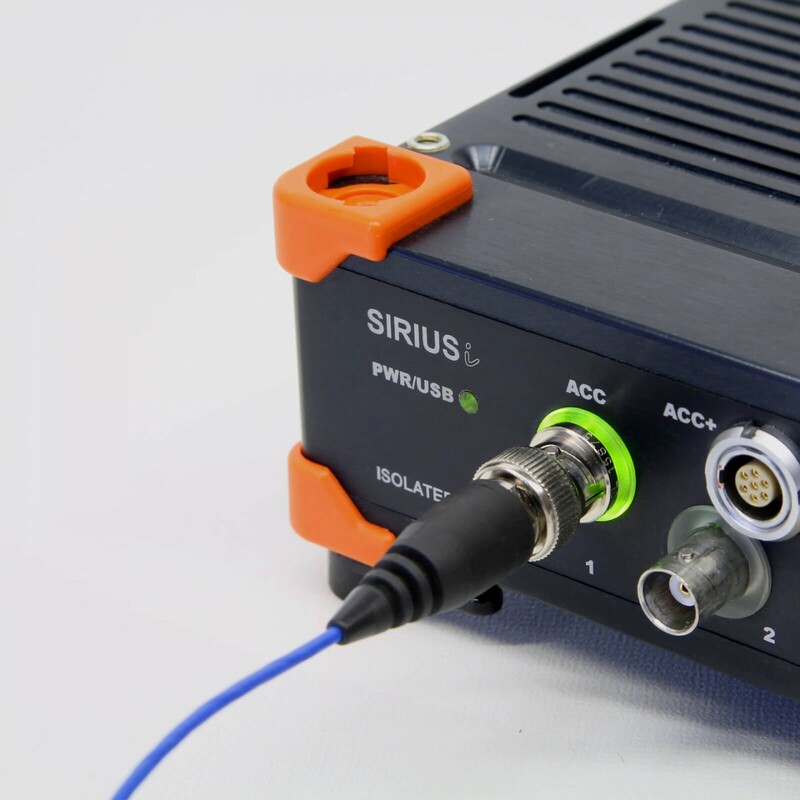 The SIRIUS data acquisition system is designed to be flexible, modular, expandable, and secure. The main goal of the development of SIRIUS was to create a simple to use device that prevents frequent errors during the measurement process. SIRIUS offers virtually unlimited configuration possibilities. Slices are available from 1 to 16 analog channel configurations and can be daisy-chained together to extend channel count. An array of different analog amplifiers are available to give you the possibility to connect virtually any sensor. Technologies like DualCoreADC®, SUPERCOUNTERS®, high isolation, and innovations of Dewesoft X3 software make SIRIUS the most unique data acquisition solution on the market today. Using SIRIUS does not require any complex configuration setups or programming. With plug and play functionality, smart sensors, and advanced TEDS support, making measurements with SIRIUS are easier than riding a bike. You will get it right the first time and you will be ready to measure in no time. Getting precise and graphically rich results is easier than ever. 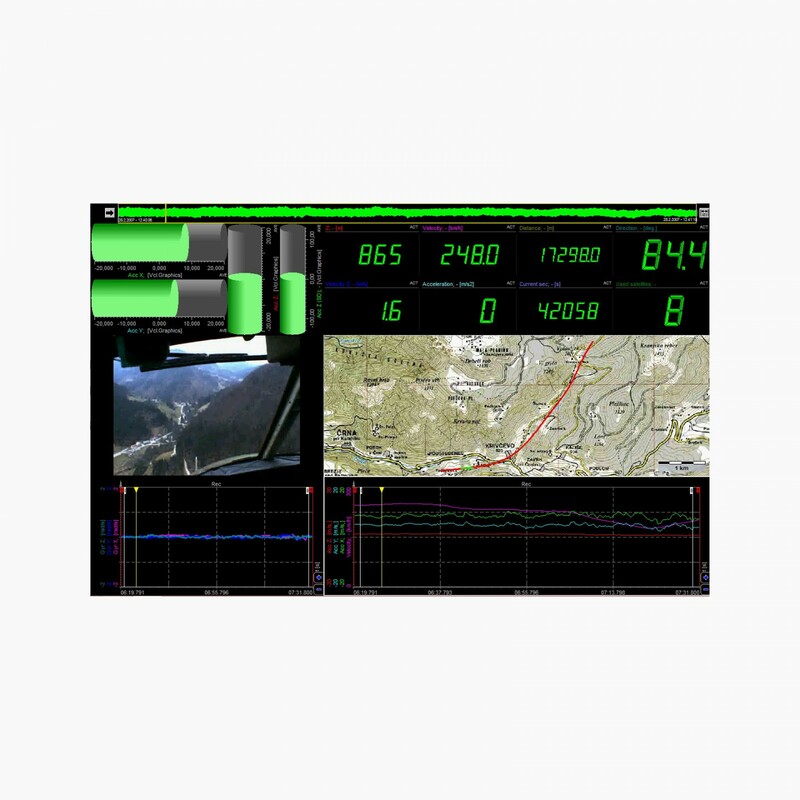 Just drag and drop one of the many flexible visual displays and connect them to your channels. Voila! It works like magic. 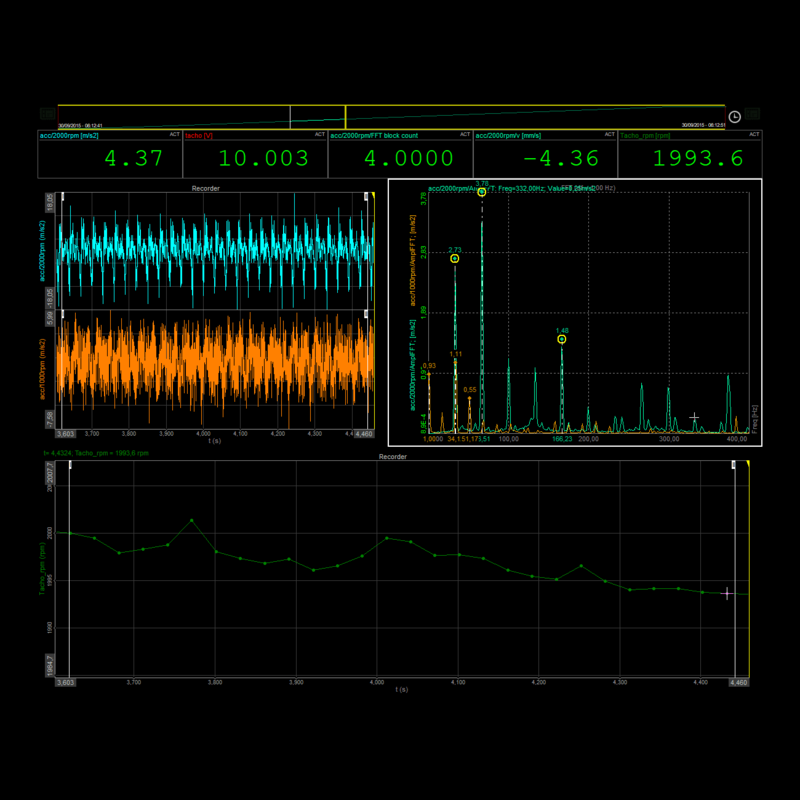 The DualCoreADC® technology solves often faced problems with signal measurement - input overload, noise, and artificial frequencies in the signal caused by aliasing. The input signal can be higher than expected (out-of-range) and therefore clipped by the ADC. This will result in an incorrect measurement and you will have to repeat the test all over again. DualCoreADC® technology prevents these problems. Each channel amplifier has two ADC's that always measure the high and low gain of the input signal. This results in the full possible measuring range of the sensor and prevents the signal from being clipped. With DualCoreADC® technology SIRIUS achieves more than 130 dB signal to noise ratio and more than 160 dB in dynamic range. This is 20 times better than 24-bit systems and 20 times less noise. SIRIUS instrument comes with high galvanic channel-to-channel, channel-to-ground isolation (±1000 V), and even includes isolated sensor excitation. With such isolation, we have no problem measuring high voltage potentials and no problem with common mode voltages. We are also safe with measurements like vibrations, temperatures, or any other measurement where non-isolated sensors are placed next to the high voltage potential against the DAQ system ground. In such cases, a non-isolated DAQ system would burn or at least give faulty wrong results. With SIRIUS it is just one thing less to worry about. Digital isolation has another big advantage - preserving frequency bandwidth of the amplifiers. SIRIUS provides "worry-free" measurements, less noise, no ground loops, and the best possible signal quality. For less demanding applications and lower cost, SIRIUS is also available with only channel-power supply isolation, without channel-channel isolation. SIRIUS utilizes a patented technology called SUPERCOUNTER® in every of its counter/encoder inputs. Slide right to find more information about each use case. Similar to the Sigma-Delta converter on the input the analog output uses a special oversampling technology which enables higher frequencies to be put out correctly. Although the maximum SIRIUS sampling rate is 200 kHz the output looks like sampled with 1 MHz. With the analog output option there is need for additional analog out hardware. 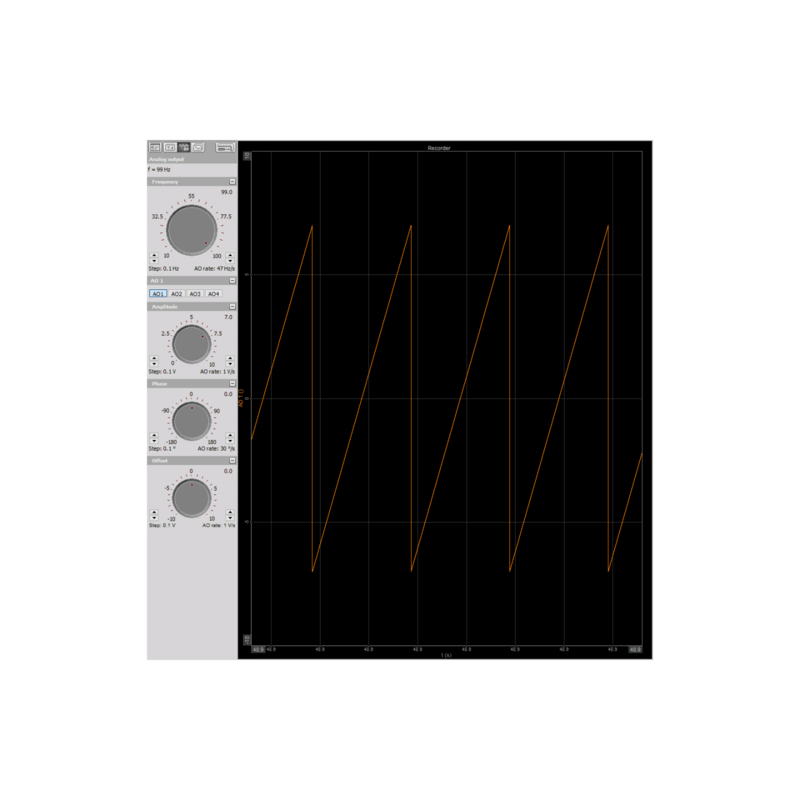 The Dewesoft X3 software includes its own multi-channel function generator, so together with the our SIRIUS hardware it is able to generate and output signals like sine, triangle, rectangle, saw, or even an arbitrary table, continuously or in sweep, step sweep, burst, and more. Fine-tuning can be done in real-time during a measurement. With the analog out option the SIRIUS unit can be used as a pure, standalone signal conditioner. No Dewesoft software or USB connection is needed. Any physical input signal is converted directly to an analog output voltage signal of max. 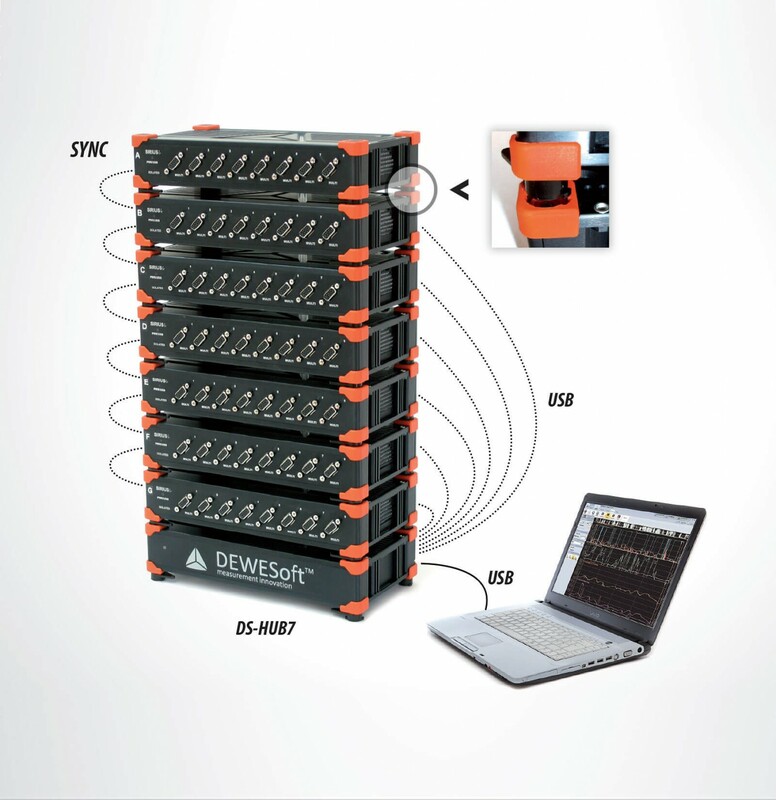 ±10 V.
Dewesoft X3 software also features control channels which allow SIRIUS device to directly access analog outputs and manually assign a value in real-time during measurement. After the measurement is done and recorded to hard drive you can replay your data file and output the conditioned channels on the analog output. This can be used for post-analysis or to feed data to a test bed simulator and simulate e.g. the vibrations during a test drive. For real-time data feed and control to a 3rd part yEtherCAT master controller please see SIRIUS EtherCAT slice or R8rt DAQ and control system Dual Mode capability. SIRIUS hardware is capable of reading different signals like voltage, strain, ICP/IEPE, charge, CAN, counter, encoder, and digital. Additionally with the included Dewesoft X3 software, you can easily acquire and combine data from additional interfaces like GPS, Flexray, Ethernet, Serial, PCM telemetry, and many more. Even though each data source can have different sampling rates, all your data will be perfectly synchronized down to microsecond accuracy. All this thanks to our timing and GPS synchronization technologies. Synchronized video can also be added for free. Dewesoft includes powerful a video engine with support for simple DirectX web cameras, 3rd party thermal cameras, and high-speed video cameras that are fully synchronized to analog data. 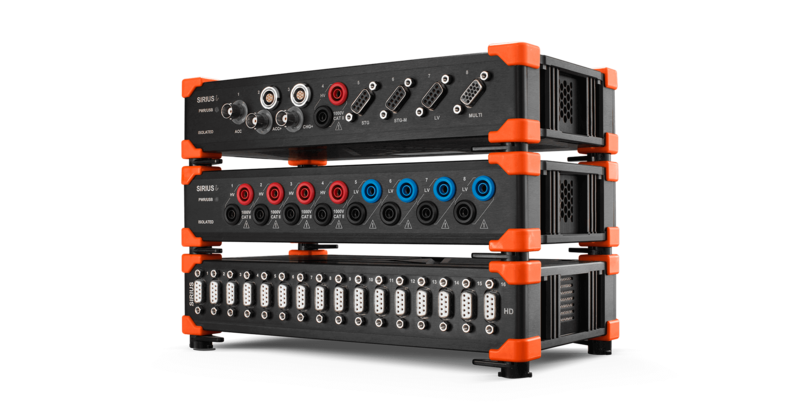 SIRIUS slices can be used as a stand-alone DAQ units or stacked and daisy chained together into larger channel count system with simple click-mechanism. With the EtherCAT interface SIRIUS slices can be distributed and placed close to the sensors to increase signal quality. Only one cable is required for data, power and sync between each SIRIUS device and can span up to 100 meters between nodes. The configuration for working with multiple instruments is as easy as working with single unit. SIRIUS slices are also available in more rugged fanless chassis enclosure without any cooling fans ready for measurement applications in heavy industrial, dust environment. All fanless SIRIUS slices are IP50 rated and completely dust protected. For even more rugged, IP67 waterproof version, take a look at SIRIUS waterproof DAQ system. SIRIUS ACC input for IEPE sensors has a LED ring around the connector. When a sensor is connected SIRIUS will constantly check current flow to the sensor and will turn the LED bright green or bright red, depending if the sensor's impedance is okay. This way you have immediate visual feedback if all your IEPE sensors or wiring is correct. This is just another small but very useful detail that makes your life as a test engineer a little bit easier. SIRIUS modular slices are available in fully isolated (1000V galvanic channel-to-channel and channel-to ground isolation) or differential version. Each slice can be delivered with one of the standard front-end options or you can freely select amplifier and connector for each of the eight available channel slots (see top slice on the left image). Some amplifiers have additional option to choose from multiple connector types. For larger projects, we can develop a custom connector type. 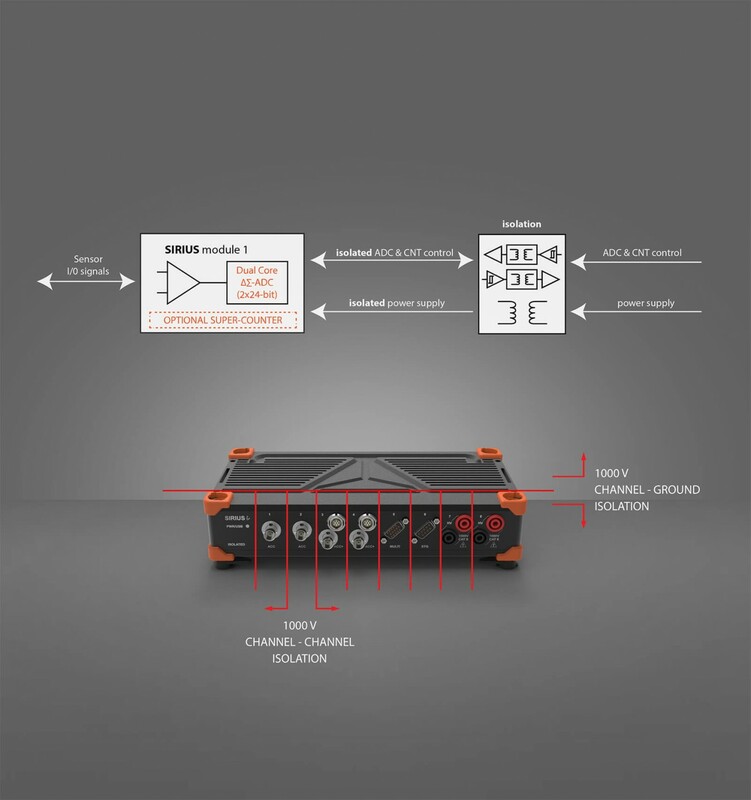 Slide right to see front-end options and connectors to choose from or go to SIRIUS tech specs for complete amplifier specification. STG: universal, most versatile amplifier for strain gages and other sensors. Available with DSUB9, LEMO L1B7f, L2B7f and L2B10f connectors. Compatible with DSI adapters. STGM: universal amplifier for strain gages with great price/performance ratio. Available with DSUB9 connector. Compatible with DSI adapters. ACC: very high dynamic IEPE and voltage amplifier for connecting accelerometers and microphones. BNC connector. CHG: very high dynamic charge, IEPE and voltage amplifier for connecting accelerometers and microphones. BNC connector. HV: high voltage CATII, CATIII ±1200V amplifier for power applications. Banana connectors. LV: all-around ±200V universal voltage amplifier for connecting current transducers and other various sensors. Available in DSUB9 and banana connectors. Compatible with DSI adapters. STG: universal amplifier for strain gages and other sensors. Compatible with DSI adapters. DSUB9 connector. Compatible with DSI adapters. ACC: IEPE and voltage amplifier for connecting accelerometers and microphones. BNC connector. CHG: charge, IEPE and voltage amplifier mainly for connecting pressure transducers for shock wave measurements and combustion analysis. BNC connector. HV: high voltage CATII, CATIII ±1200V amplifier for high speed E-Mobility and inverter power applications. Banana connector. LV: voltage amplifier for connecting various sensors, especially high speed current transducers for power analysis, E-Mobility, and inverter applications. DSUB9 or banana connector. Compatible with DSI adapters. 16xSTGS: universal strain gage amplifier. Compatible with DSI adapters. DSUB9 or LEMO L1B10f connectors. 16xACC: IEPE and voltage amplifier for connecting accelerometers and microphones. 16xLV DSUB: all around universal voltage amplifier for connecting various sensors. Compatible with DSI adapters. DSUB9 or BNC connectors. Compact, mobile data acquisition system with a built-in data logger, powerful data processing computer, multi-touch display, and internal batteries for maximum portability.